Snare drum samples from the trusty Ludwig Acrolite. This download pack will deliver the snare samples you want for rock, punk, pop, funk, alt rock, and more. The Ludwig Acrolite aluminum snare drum samples pack features a versatile snare drum at home in a number of musical genres. Due to the aluminum shell, you get a controlled resonance with solid crack on rim shots. It’s ‘between wood and metal’ snare tones allow it to sit well in rock, punk, funk and alt rock drum mixes. Users who want to apply more extreme levels of EQ and compression will appreciate these pristine acoustic samples. Included in this drum sample download set are unprocessed stereo 24- bit WAV samples that are ready to go “as is” or ready for user-defined character with EQ and compression. 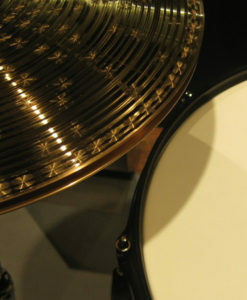 The samples include both right and left hand hits, cross stick samples, and flams. Available as a stand-alone sample pack or with the Ludwig Snare Samples Pack Bundle. 54 MB total Samples | 79 multi-velocity hits | Open, mid-range tuning | 24/44 WAV format.